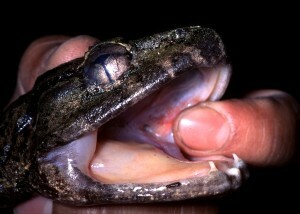 Despite a name that sounds like it came from a bizarre horror film, the fanged frogs of Sulawesi are not particularly dangerous. In fact, the exact function of the fangs – technically bony odontoid processes – isn’t really known. “They could be used for defence, although it’s not clear that that’s true,” says Ben Evans of McMaster University “They certainly don’t bite you when you catch one in your hand.” What Evans does know is that these unusual critters are a perfect example of the evolutionary process of adaptive radiation. Evans is an evolutionary biologist who has spent years studying the biogeography of the Indonesian island of Sulawesi. “Sulawesi is interesting because it’s near some large islands, but it’s biogeographically very distinct,” he says. “A remarkable and precipitous faunal divide occurs between Sulawesi and Borneo, which is famous in biogeography. It’s called Wallace’s line.” Alfred Russell Wallace, a well-known biologist and contemporary of Charles Darwin, worked extensively in the Indonesian archipelago, using it as a model system to understand the processes that affect biodiversity worldwide. Regular readers will note that I’m fond of touting the high quality of Canadian science despite our many perceived handicaps as a nation (smallish population, widely separated institutions, latent inferiority complex, etc.) But how, I hear you virtually ask, can I possibly know this is true? Is there any data to back up this claim? Well, smarty pants, it turns out there is. Sciencewatch.com is an arm of Thomson Reuters that keeps tabs on trends in published science papers and their impact on the scientific community, as measured by the number of citations. Periodically, they do a retrospective of papers from a certain country, comparing their quantity and impact to the world average. As it happens, this week they featured the True North Strong and Free.